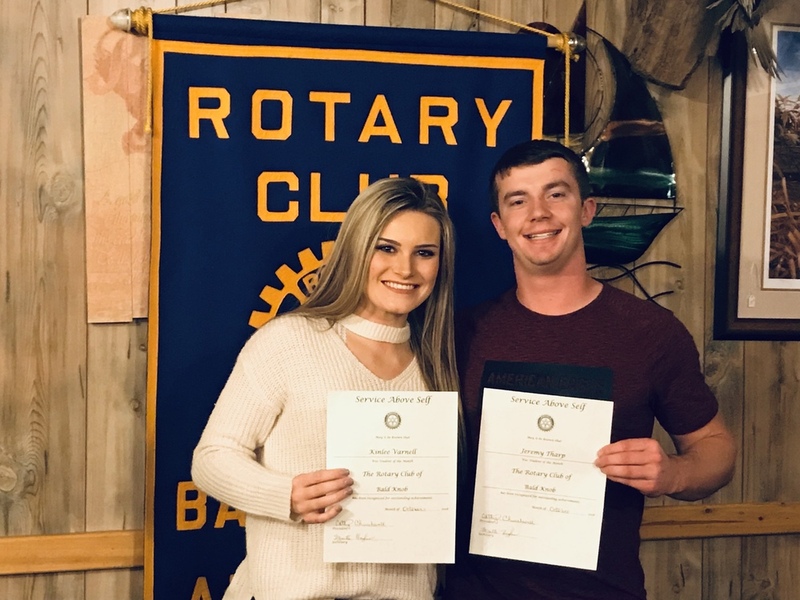 The Rotary Club of Bald Knob honored seniors Kinlee Varnell and Jeremy Tharp as Student of the Month for November. President Cathy Churchwell shared comments regarding each student from the Bald Knob High School Staff. Kinlee Varnell was nominated for the female Rotary Student of the Month because of her generous and caring heart. Many have witnessed her spirit of love toward her fellow classmates many times. Throughout the 2018 Homecoming festivities, Kinlee went above and beyond to help others. She literally stepped up and helped with the queen's speech. Her actions brought tears to the eyes of many. This is just one example among many that could be given that speaks to the heart of pure gold that she has. She is the perfect example of what it means to be a Bald Knob Bulldog. Jeremy Tharp was nominated for the male Rotary Student of the Month because of his extraordinary ability to light up every room he walks into. Jeremy is so full of life and loves to bring joy to everyone around him. He can easily identify when others are having a bad day, and he is quick to offer a hug and kind words. One individual stated, "There are only two types of people in the world: Jeremy's friends and the people he hasn't met yet. Jeremy is one of the friendliest people on the Bald Knob High School campus." Another individual stated, "He has a servant's heart and doesn't even realize it. He always puts the needs of others before his own and that is very rare among many of his peers." In all, Jeremy is kind, hardworking, and passionate about his school, family, and teammates. Jeremy epitomizes what it means to be a Bulldog and a Rotary Student of the Month.